Lifelong WONDER WOMAN fans Ray Caspio and Paul K. Bisson explore the LYNDA CARTER television series. It's a fun, lively, and informative discussion with fellow fans and notable names in Wonder Woman fandom. They also interview some of the people involved in creating the show. And they talk to the people who are creating new officially licensed merchandise, from comics to music! So what are you waiting for? 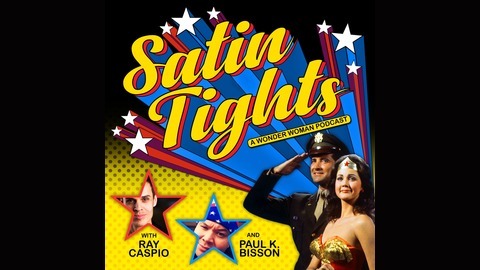 Subscribe to Satin Tights: A Wonder Woman Podcast! Finally! Our review of The New, Original Wonder Woman is here!--sort of. Actually, PART ONE of our review is here. Also, there's no review. Hey, where are you going? The truth is our recording was over four hours long! NO, we didn't plan it that way. Usually we block out two hours for recording. 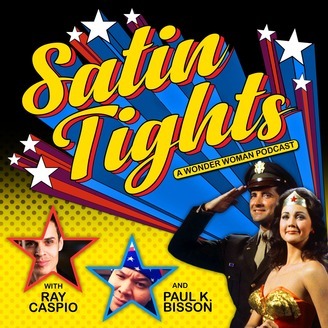 But when you have three die-hard Wonder Woman fans - Ray Caspio, Paul K. Bisson, and Special Guest Andy Mangels - discussing a 75 minute movie that holds such an important place in our hearts - and yours - well, we just had to talk about more than just the movie. And we did. A lot more. But instead of cutting a lot of that discussion out, we decided to keep most of it in and break the podcast into two parts. But don’t let that discourage you from listening… Part One is fun! There's lots of backstory, lots to learn, and we’ve even got a few surprises along the way. So, sit back, grab a snack, and enjoy! Show notes coming shortly!